ᠪᠣᠣ; Möllendorff: Hailan Boo; Abkai: Hailan Bou) is a city and the administrative center of Amur Oblast, Russia, located at the confluence of the Amur and Zeya Rivers, opposite to the Chinese city of Heihe. Population: 214,390 (2010 Census); 219,221 (2002 Census); 205,553 (1989 Census). The Amur has formed Russia's border with China since the 1858 Aigun Treaty and 1860 Treaty of Peking. The area north of the Amur belonged to the Manchu Qing dynasty by the Treaty of Nerchinsk of 1689, until it was ceded to Russia by Aigun Treaty in 1858. The early residents of both sides of the Amur in the region of today's Blagoveshchensk were the Daurs and Duchers. An early settlement in the area of today's Blagoveshchensk was the Ducher town whose name was reported by the Russian explorer Yerofey Khabarov as Aytyun in 1652; it has been identified with what is currently known to the archaeologists as the Grodekovo site, after the nearby village of Grodekovo (which is located on the left bank of the Amur at 50°07′N 127°35′E, some 25–30 km (16–19 mi) south of Blagoveshchensk). The Grodekovo site is thought by archaeologists to have been populated since ca. 1000 CE. As the Russians tried to assert their control over the region, the Ducher town was probably vacated when the Duchers were evacuated by the Qing to the Sungari or Hurka in the mid-1650s. Since 1673, the Manchus re-used the site for their fort ("Old Aigun", in modern literature), which served in 1683-1685 as a base for the Manchus' campaign against the Russian fort of Albazin further north. After the capture of Albazin in 1685 or 1686, the Manchus relocated their town, to a new site on the right (southwestern, i.e. presently Chinese) bank of the Amur, about 3 miles (4.8 km) downstream from the original site; it later became known as Aigun. As the balance of power in the region has changed by the mid-19th century, the Russian Empire was able to take over the left (generally northern, but around Blagoveshchensk, eastern) shore of the Amur from China. Since the 1858 Aigun Treaty and the 1860 Treaty of Peking, the river has remained the border between the countries, although the Qing subjects were allowed to continue to live in the so-called Sixty-Four Villages east of the Amur and the Zeya (i.e., within today's Blagoveshchensk's eastern suburbs). Although Russian settlers had lived in the area as early as 1644 as "Hailanpao" (海蘭泡/海兰泡, the Chinese name for the city), the present-day city began in 1856 as the military outpost of Ust-Zeysky; its name means settlement at the mouth of the Zeya River in Russian. Tsar Alexander II gave approval for the founding of the city in 1858, to be named Blagoveshchensk, literally means "the city of good news", after the parish Church of the Annunciation and declared to be seat of government for the Amur region. 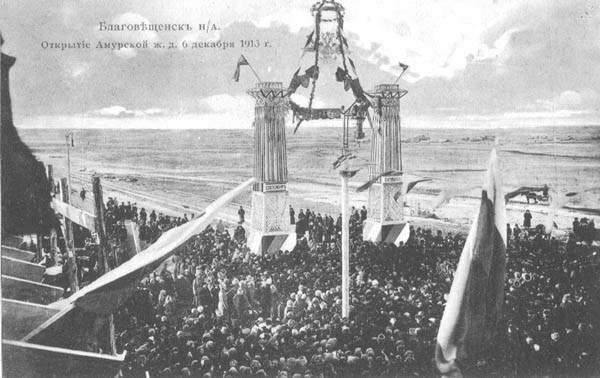 According to Blagoveshchensk authorities, by 1877 the city had some 8,000 residents, with merely 15 foreigners (presumably, Chinese) among them. The city was an important river port and trade center during the late 19th century, with growth further fueled by a gold rush early in the 20th century and by its position on the Chinese border, just hundreds of meters across from the city of Heihe. In the course of the Boxer Rebellion, the Qing Imperial army (made out of Manchus and Han Chinese) and Boxer insurgents shelled the city in July 1900. Chinese Honghuzi forces joined the attack against Blagoveshchensk. According to the Orthodox belief, the city was allegedly saved by a miraculous icon of Our Lady of Albazin, which was prayed to continuously during the shelling which lasted almost two weeks. On July 3 (Old Style), a decision was made by the city's Police Chief Batarevich and the Military Governor Gribsky to deport the city's entire ethnic Chinese community (which, according to the official statistics, numbered 4,008 in 1898), viewed as potential "fifth columnists". As the cross-river shipping was interrupted by the rebellion, a question arose how to get them from the Russian side of the Amur to the Chinese side. Batarevich suggested that the deportees could be first taken east of the Zeya, where they could try to obtain boats from the local Chinese villagers. The plan, however, was vetoed by the governor, and the decision was made instead to take the deportees to the stanitsa of Verkhneblagoveshchenskaya—the place where the Amur is at its narrowest—and made them leave the Russian shore. As the local ataman refused to provide the deportees with boats to take them across the river (despite the orders of his superior), few of them made it to the Chinese side. The rest drowned in the Amur, or were shot or axed by the police, Cossacks and local volunteers, when refusing to leave the dry land. According to Chinese sources, about 5,000 people reportedly died during these events of July 4–8, 1900. The expulsion of local Chinese caused some hardships for Blagoveshchensk consumers. Historians note that during the second half of 1900, it became almost impossible to buy any green vegetables in town; ten eggs would cost 30-50 kopecks (and in winter, as much as a ruble), while before it had been possible to buy ten eggs for 10-15 kopecks. The Chinaman, be he Hung-hutze or peasant, in his relation to the Russians in this conflict with Japan has not forgotten the terrible treatment accorded him since the Muscovite occupation of Manchuria. He still remembers the massacre at Blagovestchensk when nearly 8,000 unarmed men, women, and children were driven at the point of the bayonet into the raging Amur, until—as one of the Russian officers who participated in that brutal murder told me at Chin-Wang-Tao in 1900— "the execution of my orders made me almost sick, for it seemed as though I could have walked across the river on the bodies of the floating dead." Not a Chinaman escaped, except forty who were employed by a leading foreign merchant who ransomed their lives at a thousand roubles each. These, and many even worse, atrocities are remembered and now is their moment for revenge. So it was easy for Japan to enlist the sympathy of these men, especially when emphasized by liberal pay, as is now the case. It is believed that more than 10,000 of these bandits, divided into companies of from 200 to 300 each and led by Japanese officers, are now in the pay of Japan. The city was also the site of conflict during the Russian Civil War, with Japanese troops occupying the city in support of the White Army. From 1920 until 1922, the city was declared part of the Far Eastern Republic, an area which was nominally independent, but in reality a buffer zone under control of the Russian SFSR. 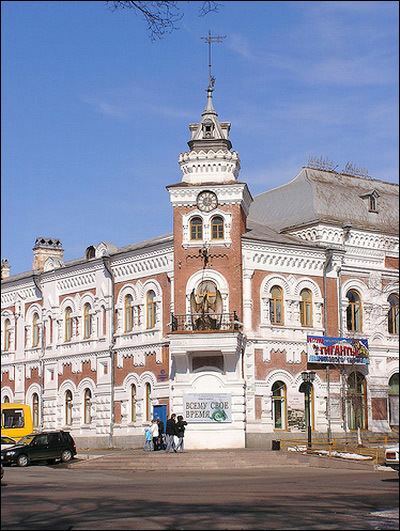 The city became the administrative center of Amur Oblast in 1932. During the Cultural Revolution the city was subject to Maoist propaganda blasted from loudspeakers across the river 24 hours a day. On August 1, 2011 Blagoveshchensk was hit by an F2 tornado. The tornado claimed one life and injured twenty-eight people. Damage costs are estimated at 80 million rubles. Blagoveshchensk is the administrative center of the oblast and, within the framework of administrative divisions, it also serves as the administrative center of Blagoveshchensky District, even though it is not a part of it. As an administrative division, it is, together with six rural localities, incorporated separately as Blagoveshchensk Urban Okrug—an administrative unit with the status equal to that of the districts. As a municipal division, this administrative unit also has urban okrug status. In July 2013, a public hearing was held at which citizens declared themselves to be in favor of a return to the direct election of the mayor. A meeting of deputies voted for rejection of the "two-headed" management. On September 2013, City Council voted for a return to the mayoral election of the mayor. Blagoveschensk experiences a monsoon-influenced humid continental climate (Köppen Dwa/Dwb) with very cold, dry winters and warm, humid, and wet summers. On 1 August 2011, it became the first city in the Russian Far East to be hit by a tornado. Since the dissolution of the Soviet Union, the city's economic focus has turned to border trade with China. The town is now home to a large Chinese expatriate community. Blagoveshchensk is part of a free trade zone which includes the Chinese city of Heihe, located on the other side of the Amur River. Main industries in the town include metal and timber processing, as well as paper production. The city is served by a branch highway and railway connecting it to Belogorsk on the Trans-Siberian Railway and Trans-Siberian Highway. It is also served by a river port. On the other side of the Amur River is Heihe, Heilongjiang Province, China, which is the starting point of China National Highway 202 that goes south to Harbin and Dalian. Ignatyevo Airport, located 20 kilometers (12 mi) northwest of the city center, serves domestic destinations.